The worst thing about taking a hiatus from blogging–whether intentional or not, but especially if it’s not–is coming back and feeling like you have so much to catch up on, and so much to talk about. This was definitely an unintentional break. I got busy with the holidays and morning workouts have edged out the time I used to use for writing and I just never made the point to do it. I’ve thought about it a lot, I have a list of things I want to get caught up on and talk about, bits and pieces of podcasts that have made me think “blog post!” but nothing has come to fruition. So, new year, time to buckle down and make this blog thing happen again. I’m not going to try to do a massive post to catch up on everything, I’m going to try to break it down in to several posts over at least the next week so it’s not a massive brain dump and I can do each thing proper justice. First things first, then I’ll backtrack some (if you want to call it that)…2016 year in review and goals for 2017. I ran 18 races in 2016, the most I’ve ever done, edging out my previous record of 16 races in 2013. 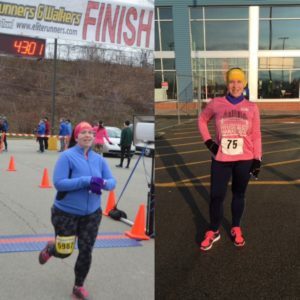 I definitely didn’t love running, or 5ks, when I set the goal to do a race a month in 2016, but somewhere along the way I fell in love with running again and learned to love 5ks as well. I started the year basically half-assing and doing the races for the sake of doing them, but after some soul searching and gentle nudging from a friend I started to actually *run* again. And I came back stronger and faster and I just want more. This is my focus, and will be the key to achieving my goals. In some respects I am very disciplined (working out, going to bed on time), in others I’m not nearly as disciplined as I should be (diet, stretching/foam rolling, drinking water). And developing and improving that consistency with self-discipline will be necessary. I turn 35 next month. Never in my wildest dreams did I imagine that I would be an athlete when I turned 35. But I am and it’s time for me to act like it. The best is yet to come. We’re all creatures of habit, but I seem to be especially so. I like structure and routine. I like planning and checking things off the list. I’m an early riser, not sure if that’s by nature from years of not having a choice as a kid, but at any rate I get up far earlier than most would deem normal or necessary. I also go to bed far earlier than most would find normal. But that’s my life and I like it. Though lately I’ve been feeling stuck in my routine and like it’s just not serving me. I’m big into listening to podcasts on my commutes, I find them more stimulating than music and far more appealing than talk radio because I control the subject matter. One of my regular podcasts is the 5 AM Miracle podcast with Jeff Sanders. It’s all about productivity and geared toward getting the most out of your day by getting up early and hitting the ground running. He talks a lot about routines and your ‘ideal’ morning. Although frequently I’m not into the actual advice given, the spirit of the show is motivating to me. And this week in particular he was discussing 7 things to do before 7 AM. The big one for him is to exercise in the morning, and that resonated with me. I’m an early riser, but I don’t always use my morning time well. I’m not an early morning exerciser. I’m just not. I wish I could be, but when I’ve tried I don’t get a good workout because I am literally just going through the motions. And while I can get up and go when the situation calls for it, I much prefer a more gradual wake up–I like my coffee and kitty snuggles. Still, I want to use my time well, I want to be productive and go into my day feeling accomplished. So I’ve realized morning is a good time for me to write, to get focused on the day and what I really want before I head to what pays the bills. I can do that with a cup of coffee on one side and a cat on the other. That said, I’m also an avid exerciser. I love fitness. But even my habits in that realm have slipped. When I was single and my time was purely my own I had a regular routine that I was very diligent about. Flash forward to new marriage with a husband to work around, new day job, new home in a different area (with a substantial commute), and I’ve struggled to create a new routine–in part because I’ve tried unsuccessfully to make it happen in the morning. 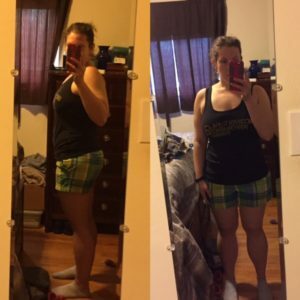 I take a kettlebell class twice a week after work and most of the time that seems to be an ideal time for me to work out, I have energy, I can get out frustration from the day, and I feel good when I’m done. While many will say the best time to work out is in the morning, and I hear their points, I’m a firm believer that the best time to work out is when you will do it (and the best workout is the one you will do). Doing beats not doing. So for now, post-work workouts will be the plan. I’m working to accomplish two goals–to write more and to work out more consistently–by flipping my schedule and being intentional. I’m hoping that making my goals and plans public will also encourage consistency by keeping me accountable. Let’s see how this works, shall we?